The Nun Trailer Has Arrived | Nerd Much? The Conjuring Universe is continuing to prove it’s a powerhouse horror franchise with each film that comes out of it. This morning we’ve got our first trailer for the next one headed our way – The Nun. 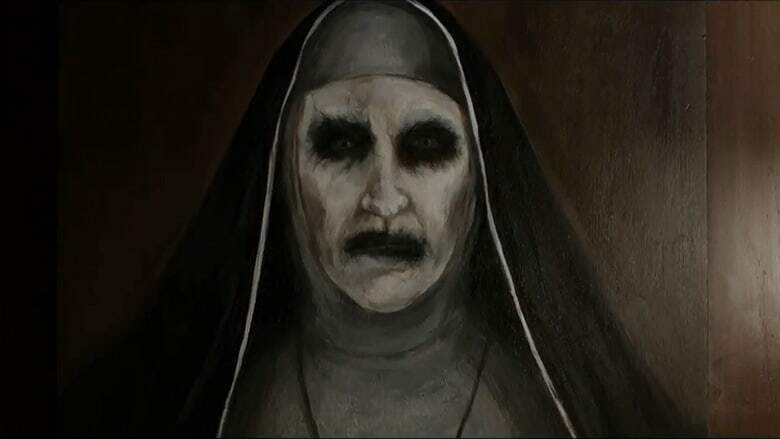 The Nun is being directed by Corin Hardy with James Wan and Peter Safran producing. The script was put together as a spin-off of The Conjuring 2 by Gary Dauberman and Wan. It revolves around the Demon Nun character that debuted within the sequel. The movie’s primary cast includes Demián Bichir as Father Burke, Charlotte Hope as Sister Victoria and Jonas Bloquet as the local nicknamed Frenchie. Bonnie Aarons reprises her role as Valak the Demon Nun and Taissa Farmiga takes one of the leads as Sister Irene. Interestingly, Taissa’s sister Vera Farmiga portrayed Lorraine Warren in The Conjuring. One has to wonder due to their strikingly similar features whether the characters of Lorraine Warren and Sister Irene are somehow connected within the franchise. Horror movies are typically much cheaper to produce than your standard Hollywood blockbusters. So should a film from the genre hit it big in theaters, it likely means a robust return for all those invested. That’s proven true thus far for The Conjuring Universe. The franchise consists of The Conjuring, Annabelle, The Conjuring 2 and Annabelle: Creation. Those four films have amounted to an overall budget of $81.5 million against Warner Bros. books since 2013. Combined, they’ve raked in $1.2 billion for the film studio. For that reason it’s no surprise that the series rolls on. The Nun is scheduled to hit theaters September 7th, 2018. Another spin-off dubbed The Crooked Man is in early production. And there are plans for The Conjuring 3 as well as another untitled Annabelle flick. For other upcoming horror titles headed our way, checkout Nerd Much’s full list right here.